We started sailing again early. 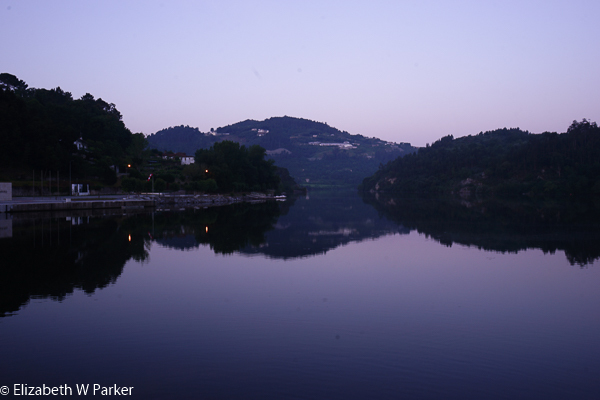 I was awake already – had even taken a few photos of the dawn over the river. Just before breakfast we entered our second lock of the river. (The first was in last night’s sailing, and there will be 10 in all – 5 going up the river and the same 5 coming back down). Going through the locks is always interesting to me. Most of them are part of a hydroelectric dam. The ship fits into the lock perfectly, with no room on either side, front or back. On our way to breakfast, Gerry and I went up to the sun deck to watch the process from above. We had to duck: The ship was still rising in the lock and there was a cement walkway above us. Clearance was about 6 feet, when we stopped moving. 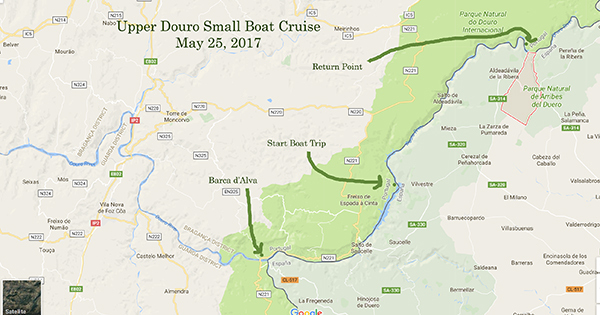 We sailed until about 10:00 and then got off the ship in Peso da Regua to see a presentation at the Douro River Museum. The building where the museum is housed was formerly used as a place where the regional port wines were tasted and analyzed for quality before being put into barrels and sent downriver to Porto. There are still old bottles in the tall cabinets labeled by estate. 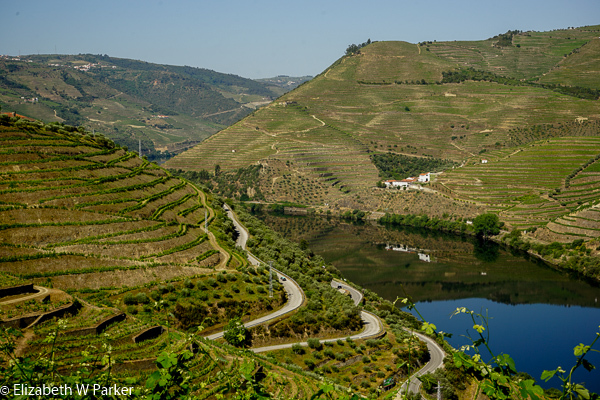 The Douro was the first demarcated wine area in Portugal and the third in the world, behind Chianti (Italy) and Tokay (Hungary). We listened to a special presentation by one of the docents from the museum. It was really fascinating. 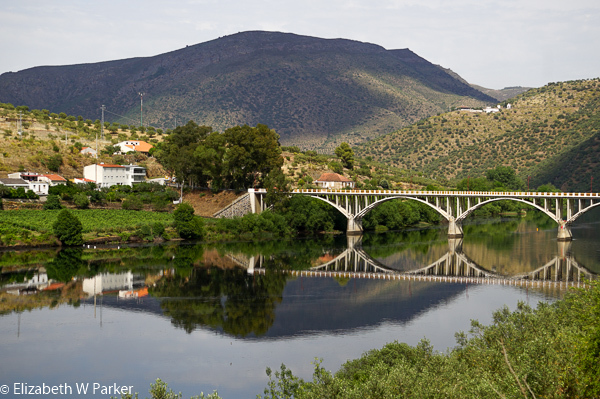 Especially interesting was how the Douro River was so dangerous – narrow, swift, with rapids and water falls – that every year sailors were lost and barrels dumped into the river. Fortunately for the barrels, they were never filled completely, so once in the river, they floated until they could be rescued. Unfortunately for the sailors, most of them didn’t even know how to swim. In the 1960s, it seems everyone had had enough of the river’s whims, so a huge project was undertaken to build the five dams and the five locks. 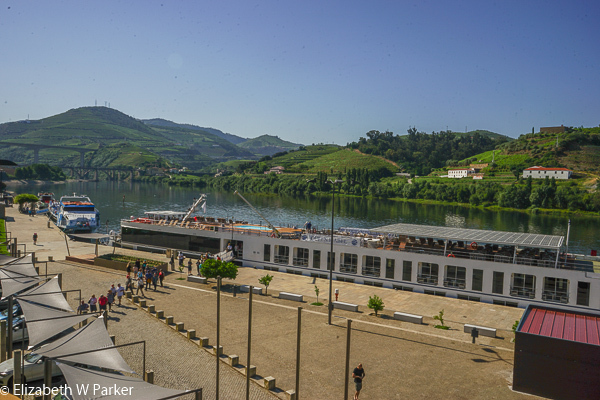 Now the Douro is a peaceful, even lazy river, with absolutely gorgeous scenery on both sides! Of course, our presentation ended with a wine tasting…not port… but red and white table wines also produced in this region. Next, we were taken to the Mateus Palace. This is the building that appears on the label of Mateus rosé wine, but that is currently its only connection. 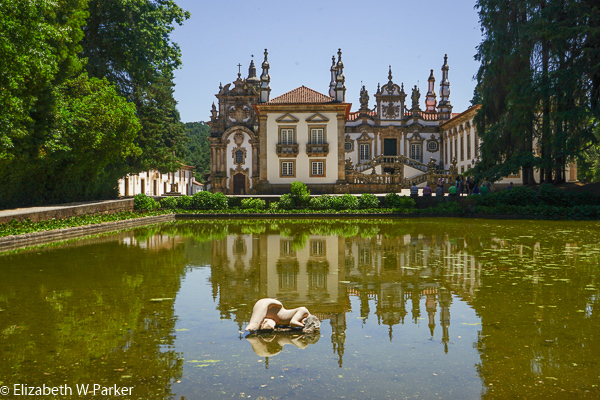 The Mateus wine and the palace both get their name from the village. The palace was actually a “country house,” more informally decorated than what the word “palace” conjures. The wooden ceilings were especially beautiful. The Count and Countess of Mateus still own the palace and use it in the summertime as their residence. The gardens were quite special. Unforgettable for me was an enormous hedge. It was so big, that there was a walkway inside! 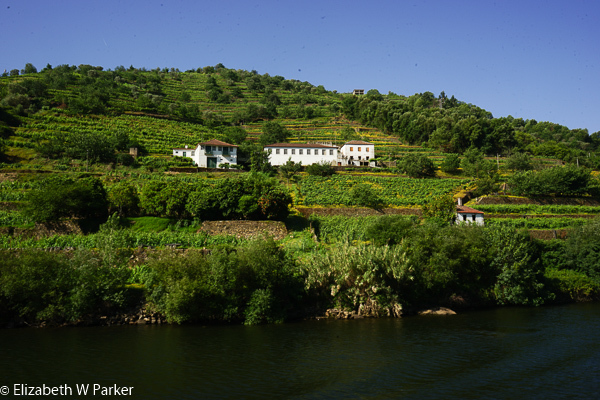 We were back on the boat for lunch and the afternoon sailing to Pinhão, one of the most important centers for port and wine production in the Douro valley. 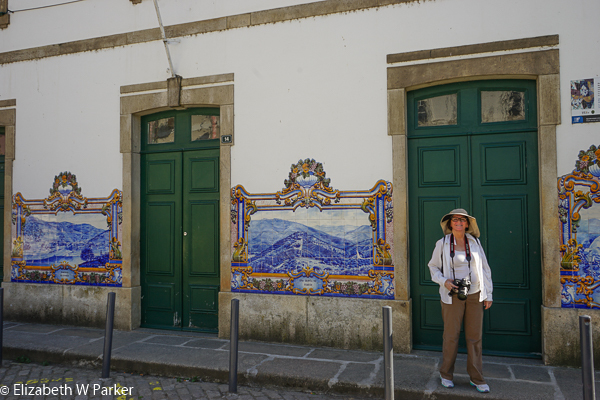 After a lazy afternoon sailing, Cindy and I spent a hour walking around the village of Pinhão, shopping and sightseeing. It was terrifically hot though (about 98 degrees F)…getting back to the air-conditioned boat was like walking to an oasis in the desert…would we ever get there?? I found it surprising that this valley is famed also for the extremes of its weather. Blazing hot in the summer and frigidly cold in the winter. I always thought that grape vines need a more stable climate, without those huge swings. The extremes are the reason the port is moved to Porto for aging. The evening passed as usual. A long, leisurely dinner in the dining room (food and service are stellar! ), a lot of wine, and an early bedtime. Dinner on the ship – Gerry drinking Mateus! Today we took off early for the Sandeman wine estate called Quinta da Seixo. 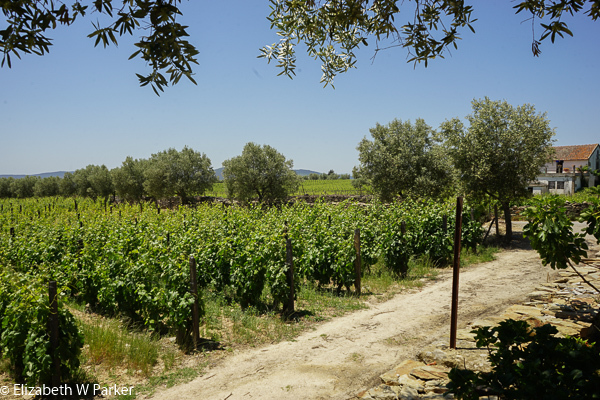 “Quinta” is a wine estate – distinct from a regular farm. In this river valley we don’t see many animals, but we see hectares and hectares of vines and olives. Foods that grow together should be consumed together, wouldn’t you agree? Wine and olives and olive oil – sounds like heaven to me. Sandeman makes a port (this region) and sherry (near Jerez, Spain). 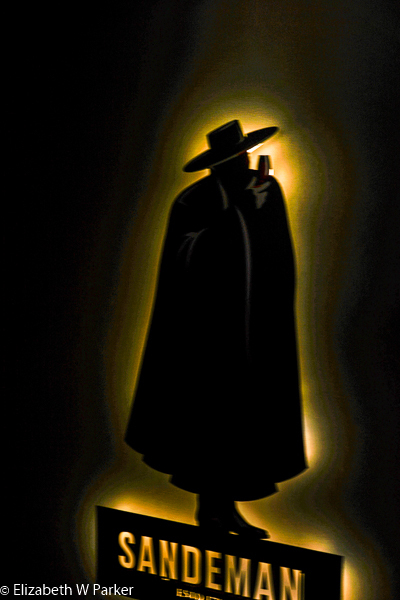 Their man of mystery logo (think Zorro) is a combination of the student capes of Portugal with the typical Andalusian hats – both Portuguese and Spanish, like their products. 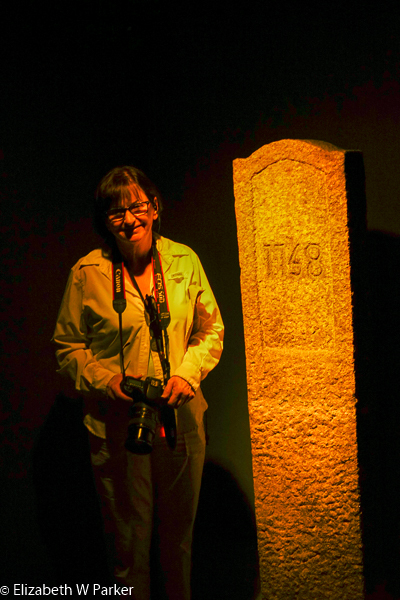 Founder’s stone at Sandeman. Love the model, don’t you? 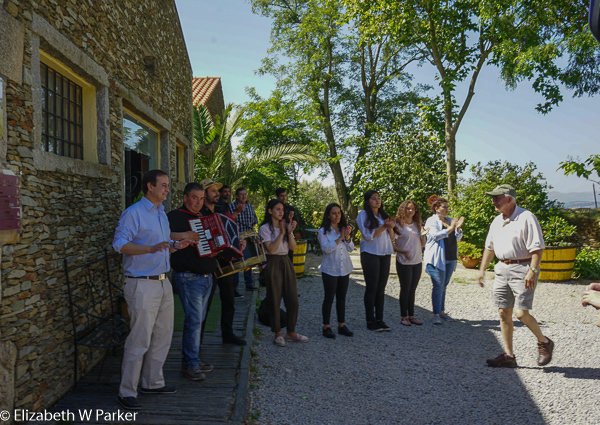 The tour we had of the estate was very professionally conducted by a young women in the cape and hat of Sandeman. Most of their grapes are grown on this quinta, but Sandeman, (named for a young Londoner in the 1700s), has vineyards all over the region. Here in Portugal, they make port, as I mentioned earlier. They make ruby port, named for its color. Ruby port is aged only a few years. And did you know that the longer port ages, the color changes? I didn’t! But as it ages and loses its red color it becomes “golden” (translate: more brownish red). This is tawny port, usually aged at least 10 years. port continues to age in the bottle, and for that reason vintage port bottles are black. A walk through the streets of Porto, looking into the windows of port wine sellers, reveals bottles of astronomical prices – vintage ports! Vintage ports have grapes that all come from a single estate and are deemed to be extraordinary after the first few years of aging. 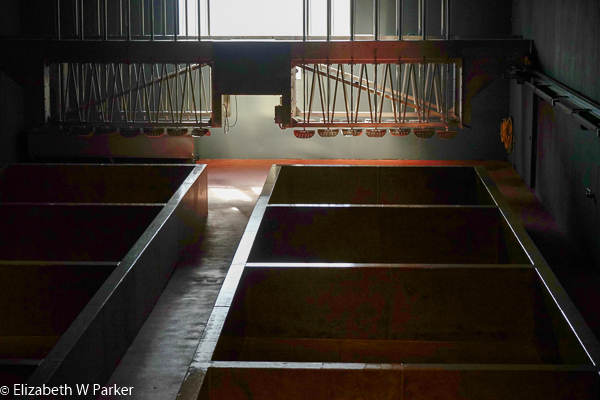 A memorable aspect of Sandeman’s production is that the crushing of the grapes (think men in vats with no shoes on…) is done by robots. We got to see the machine and the vats (though not in action – it is the wrong time of year). The machine has two rows of basket shaped plungers on a contraption that allows them to be moved along from vat to vat, to do their stomping. About 10K bottles are currently in the cellars at this location, but once the port has aged in oak barrels for 2-3 years it is moved to the Sandeman wine lodge in the city of Gaia (Porto). It finishes its aging there before being shipped to locations around the world. About 90% of the port produced in Portugal is consumed abroad. More fun facts to know and tell – White port is an aperitif! Check out Sandeman’s website for 50 cocktails to make with white port. Ruby port is exclusively an after dinner drink, pairing brilliantly with chocolate, nuts, cheeses and most berries. We sampled both the white and red. We got some great views “down the mountains” from the Sandeman estate to complement all the “up the mountains” views we get from our ship on the river. The quinta de avessada is on the top of a mesa. Notice how flat it is up here. Welcome to the Quinta de Avessada! That’s Luis in the blue shirt and white pants! The presentation we got here was hilarious! The young owner, Luís Barros has quite a shtick! Looking like a cross between Mr. Bean and Pee Wee Herman, we were laughing and smiling as he told us the history of his family’s farm, how the muscatel is made, and told us stories about the food we were eating and the wines we were drinking. What a very pleasant way to spend the lunch “hour” on a hot day in Portugal! Will we make it under the bridge??? Crew had to flatten everything on the roof. We were back at the ship by 3:00 pm. As we walked from the bus to the ship, I had to stop and stare as a riverboat floated under the bridge, clearing it by what looked like inches…Once we were back in the cabin resting, we were alerted to something going on with our own boat…so we went out onto our balcony to discover that we were about to go under the same bridge. Our crew was madly dismantling the sundeck upstairs and we, too, just squeaked under the bridge! We sailed until we had just crossed the Spanish border, and then docked for the night in a very pretty section of the river, at a place called Vega de Terrón. 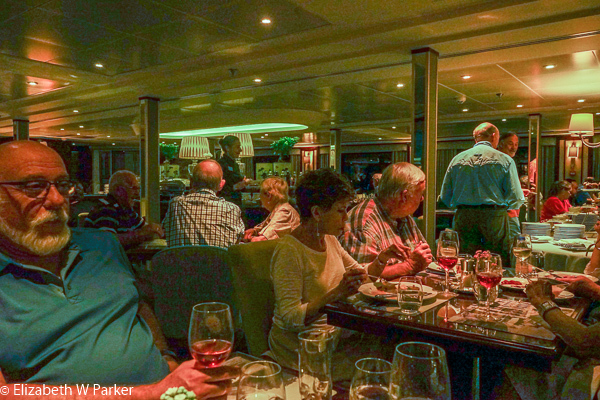 Our group of 15 had dinner all together in one of the private dining areas of the ship. It was lots of fun, because we all know one another a little better now (versus the dinner on May 20th in Lisbon with Chef Diogo) and so our conversation was lively and engaged. After dinner, I took a few photos of the bridge and then met up with a few diehards to sing and dance in the lounge. We had a wonderful guide on the boat. 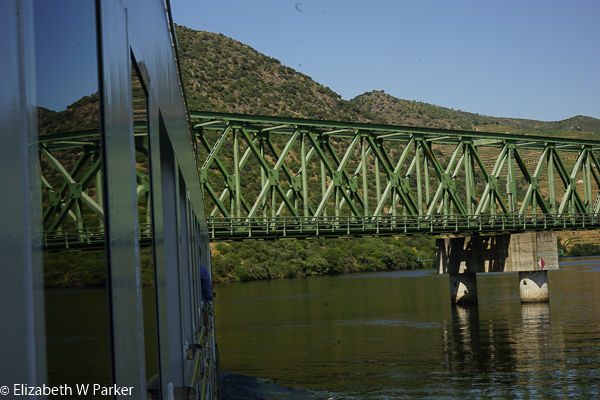 As we cruised, he told us about the national parks that share the land on both sides of the river – Spain on its side, and Portugal on its. He would point out birds, nesting sites, and tell us about the other fauna that are in this area. The water was very calm on our way up the river and I took some really fun photos of the reflections in the water. (See the slideshow below.) On the way back down, we had a breeze that ruffled the water, and an almost overcast sky that robbed the scenes of their contrast. It was a relaxing, enjoyable trip. 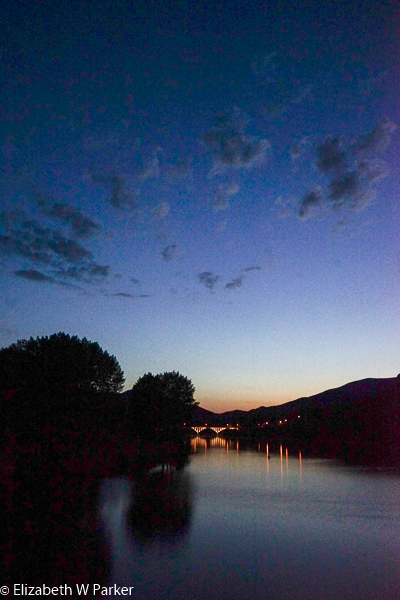 We returned to the Queen Isabel, not at Vega de Terrón, but back in Portugal at Barca d’Alva – the town of the beautifully, illuminated bridge from last night. Bridge at Barca d’Alva – back to the boat. A quiet afternoon on the boat allowed me to post a third segment of the Spain portion of this trip to the blog. Later in the afternoon, Gerry and I also took a walk in Barca d’Alva – but the cooler temps of the river this morning are history and it is back up in the sweltering 90s. AC, please! I hope you enjoy this slide show of the kaleidoscope views we had on the way up river! Continue the journal with our trip back down river.